New and exciting Indica dominant hybrid with an exceptionally high THC content. We are now able to offer Gelato cannabis seeds for sale in Canada. This extremely potent new release from Crop King is already in high demand, and with savings now offered on both 10 and 25 seed packets, that’s only going to increase. Don’t hesitate and wait until they are out of stock, buy Gelato cannabis seeds in Canada today and begin growing your own high quality cannabis buds. Our recommended Gelato cannabis seeds are all completely feminized, containing no male chromosomes, ensuring each seed produces a pure female plant. Vibrant and stable, comprises of Sunset Sherbet and Thin Mint Girl Scout Cookies, making it an Indica dominant plant, although not one recommended for beginners. Perfectly adapted to both indoor and outdoor growing techniques, Gelato feminized cannabis seeds can be grown either indoors, within a purpose built growing area, or outdoors, given the correct conditions, which is unlikely if you are growing cannabis seeds in Canada. With its Indica dominant heritage Gelato feminized cannabis seeds grow to a moderate height, making them a perfect choice for growing indoors.Flowering times average between 8 – 10 weeks, depending upon conditions, with impressive yields that return between 500 – 700 grams per square meter when given ideal growing conditions and an experienced grower. Gelato cannabis is well known for its sweet, candy flavor and uplifting, energizing high, loved by smokers across the USA and Europe, its popularity has grown since winning many recent expo’s and Cannabis Cup’s. Although not the easiest strain to grow, with a little care and good indoor growing conditions, you can grow Gelato cannabis seeds indoors successfully and enjoy some of the very best, new cannabis available. 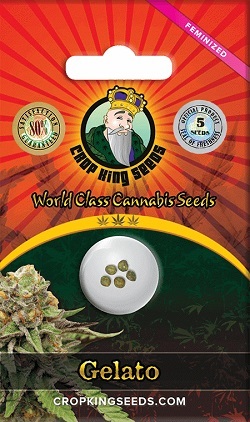 As with all our recommended cannabis seeds for sale in Canada, we recommend Crop King for your purchases. With the relaxation of many of the laws regarding the growing and possession of cannabis and marijuana, more and more people are buying cannabis seeds online in Canada and growing their own plants. Buying cannabis and marijuana seeds online in Canada from a trustworthy and reliable supplier is paramount to your success, and with a proven track-record, in both quality and delivery, we believe there is no-one better at delivering on that promise than Crop King. You can buy Gelato cannabis seeds through us in packs of 5, 10 and 25 feminized seeds, click below to learn more. Buy Gelato Cannabis Seeds today and receive fast discreet shipping to Canada and all US states.